This paper offers a critical review and reflection on the first decade of publishing of scholarly and review articles in Island Studies Journal. Following brief comments on the politics of publishing in any field, and in island studies per se, attention turns to consider how Island Studies Journal has contributed to and shaped the study of islands; reflect on what is written, by whom, using what broad methods of approach; and how the journal has tracked in terms of readership and citations. 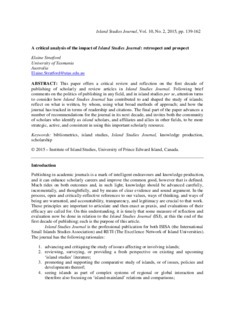 The final part of the paper advances a number of recommendations for the journal in its next decade, and invites both the community of scholars who identify as island scholars, and affiliates and allies in other fields, to be more strategic, active, and consistent in using this important scholarly resource.